“Eh, girl, you’ll never find it that way,” the voice in my memory is as clear as if she’s standing right behind me. In the days after Ostara, my beloved, chain-smoking mother-in-law died… essentially from the flu. I shake my head in sorrow yet again and set my teeth. It’s 2016, but we might as well be living in 1918 for all the good the antibiotics did. She wasn’t that old, only 72. She washed windows earlier on the day she went into a coma from the sudden onset of opportunistic pneumonia, though she was already sick. She was the picture of a rugged farm matriarch. She always said she’d stop when she was dead, and she was right. She ruled her kitchen with an iron fist. She cooked all the meals and this is the first time I’ve ever been allowed to rattle around her kitchen, the first major holiday we’ve spent in her home without her. It’s the eve of Beltane and I’m trying to cook spaghetti for a house full of Czech uncles and cousins. I know she used to keep a lot of kitchen utensils in the front hall closet because her kitchen looks perfect and thus it has a sorry lack of storage space. I can’t find the strainer… or the cheese grater anywhere. And there are some in the family who are gleefully waiting for me to fail simply to prove one point or another. I poke through shelves full of the parts of her many mysterious kitchen appliances. She never showed me where anything was because she didn’t let anyone else fuss with her kitchen, least of all me. I was good with entertaining hordes of little cousins and hauling wood and collecting medicinal herbs. We both agreed I wasn’t that good in the kitchen. I can hear the men tramping on the veranda. And I don’t have anything to strain the noodles with. “Damn it, Marie, you could at least give me some ouija board sort of sign, couldn’t you?” This is a very patriarchal culture and there will be overt criticism if I don’t have lunch together properly. The men and children spill into the hallway and the next thirty minutes are chaos. Yes, I get hassled for not having it ready. Then I get criticized for getting crumbs of cheese on the floor from using a makeshift cheese grater. We never did find the real one. Later I sit with the other women who have married into the family by the Beltane bonfire, watching the men of the village, including all of our husbands, raising a 50-foot maypole by hand. It’s hazardous. The damn thing could fall on them. It’s a full grown pine log after all. But I’m still very glad this village has hung onto the old traditions. Few places have their history so well rooted. My husband’s family farm dates back six hundred years. The long stone farmhouse itself is four-hundred years old, the walls as thick as those of a small castle. Marie used to tell me stories she had learned from the village chronicles about her husband’s family, not so much about her own. She took on many of the ideas of this patriarchal society, where a mother’s history is less important. But they wanted to put her ashes in the Catholic church yard in the next village, with her husband’s ancestors. My husband refused and stood alone against the other men over it. She had told him she wanted her ashes buried in an urn in a beautiful place between two ponds under a great oak tree at the back of the farm, not in the yard of a church she’d never put any stock in. I watch the flames of the Beltane fire lick at the ragged skirts on the figure of a wood and straw “witch” the villagers made. This is also tradition. Beltane is not called Beltane here but “witch burning night.” Some say it is the crone of winter that they burn and that it is not an anti-Pagan tradition. Most of the villagers are no more Catholic than Marie was. But still the sight sends a shiver up my spine, a sharp contrast to the warm Beltane evening full of live music and revelry. I was worried because she wouldn’t be here to remind me which herbs were ready when I visited the village. I am good with medicinal herbs if I know they’re there. But initially finding them is hard when you’re almost blind. But it seems like my memories of her will help some. It is a wonderful Beltane all around. I’m not actually the only woman who cooks and though there is some criticism, I come through pretty well. I eat too many goodies and feel a bit guilty with that instinctive shame this society has taught me. She was roughly barrel-shaped herself but more muscle than anything. The same flu that killed her did make me get thinner than I’d been in quite a while. But not being thin hadn’t helped her. The cigarettes played a role. Everyone knows that but few say it. The things we let society do to us. I lie down in one of the many beds late at night and whisper goodnight to the ancestors in the walls made of field stones. A glorious, joyous Beltane to you and yours! Beltane is a time for joy and love. It can be romantic, familial or sexual. But it can also be the love of purpose and meaning--i.e. passion for creativity, craft or calling. It can also be love and acceptance of others in the world. Reach out to someone of another culture, religion or social group. Not in some grand way, where you save someone. Just in a personal way, like a friend and neighbor. Reach out with an everyday action such as inviting someone to a party, even though they aren't exactly the same as your "regular" friends. Or make space for someone to speak who is usually fairly quiet at meetings. When there is someone in your class or on your street with a disability or other difference, make sure they are welcome and invited when friends and neighbors get together--not out of charity but because that's the kind of world you want to live in. Include. Even when there is a small risk. This is how we become unified. Gaia, Damu, Durga, Atabey, Nammu, Mawu, Pachamama! Our mother the earth, blessed are your names. Blessed are your forests, deserts, marshes and mountains. Blessed are your waters, your life blood that gives life to all. Blessed is your breath, the air that maintains our spark of life. Blessed are all your growing plants, herbs and trees. Blessed are all the creatures, your children. We are one family. Blessed are all the people of this earth.. The same rhythm beats in every stranger's throat. givers of light that fill our hearts with awe. Soul of the earth, our mother, blessed is your name. The night is dark as you drive out across the East Bohemian highlands. The lights of villages are hidden deep in the vales and hollows of the rolling land. The smell of plum blossoms prickles your nose and there is still a nip in the air on the last night of April. Then you round a bend and catch your breath. The stars have fallen onto the hills. For there… and there… and there... and right above the road… and twinkling far off to the south are the fires on the hilltops. And there is something in you that knows this calls back across the millennia and connects you through the land to those who came before. When I first came to the Czech Republic I didn’t know about the tradition of Beltane fires. I grew up with earth-based spirituality but we didn’t call ourselves Pagan and Beltane was actually one of the few Pagan holidays we didn’t mark in any particular way. I d heard of it, of course, but mostly in a historical context. Then I drove out to East Bohemia one Beltane night and my soul sang with recognition. This is one of the places in Central Europe where Beltane fires are still lit on the tops of hills and groups of people sit around them and play guitars or flutes to commune with the stars. Today much of the meaning has been lost… or it seems to have been. As with so many Pagan holidays, this one has been corrupted by later anti-Pagan influences. 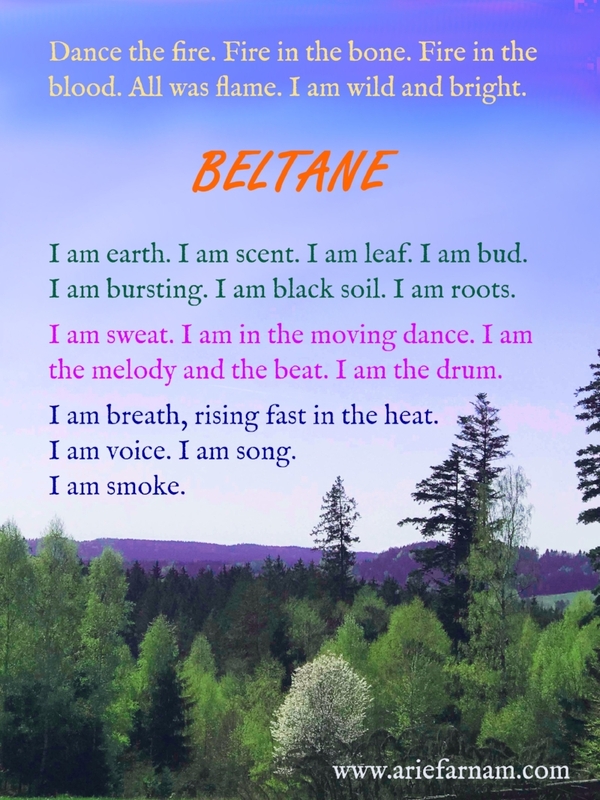 Beltane is actually called "the Witch” in Czech. And before you get excited about that you should know that the reason it's called the Witch is because it's supposed to be about burning witches. Czech children are encouraged to make ugly, mocking figures of witches and mount them on stakes in the midst of the bonfire. In my husband’s home village, far to the south in the flat swampy land of South Bohemia, they raise a sixty-foot maypole each year. They don't use any machines to do this, despite the abundance of farm tractors and cranes in the village. It's still an experience of male bonding in which all of the men, young and old, use a system of levers to raise it. There's no dancing but there is sometimes music. The bonfire is as big as a house and usually has multiple stakes with the female figures tied to them. The men of Stribrec village raise the maypole next to the witch fire. I try to embrace the good parts of these traditions. There are usually plenty of children around who are eager for a craft, so I bring materials to make flower and leaf crowns. And we play circle games in the dusk on the village green where the bonfire burns. At least it's a Pagan holiday that is still celebrated here, despite the gruesome imagery. But still... I can’t celebrate Beltane here without the shadow of sadness or without my trigger buttons of social trauma being pushed. The concept of outcast witches being burnt in fires is a little too close to home when I experienced extreme ostracism and outcast status as a child, due to my vision impairment and earth-based family culture. Some people, many Czech Pagans included, put a positive spin on the tradition of burning the Witch. They say that the witch figures are “the witch of winter” and burning them (or in some cases casting them into a flowing river) is a symbol of letting go of old, outmoded thinking and making way for new spring growth. I support this weaving of traditions and that is what I tell my children about the witches in the Beltane fires. The are four and six years old and a little young for explanations of the darker aspects. They will encounter this Czech tradition everywhere at this time of year, so I can't abolish it. I can only change my attitude towards it. Yet I can easily imagine a lighter and more joyful Beltane. Two years ago, we stayed home on Beltane, instead of visiting my husband’s village and we built our own maypole and engaged the kids from our neighborhood in dancing with ribbons. We made flower cake and leaf crowns and sang songs. We hung flower decorations from our fruit trees and built our own bonfire for a brief ritual to celebrate life and passion of all kinds. I enjoy joyful Beltane celebration of love and life. But then I miss the depth of feeling in the other, grittier version. Though most Czechs don't know it, they celebrate Beltane by dancing along the knife edge of history, going back more than a thousand years to a time when Celtic druids walked these hills and celebrated the rite of spring. And so maybe the symbols of pain and suffering are fitting after all. They tell of the resilience of these people who were forced to change and adapt by multiple invading hordes, by a succession of foreign kings, by a monolithic religion that tried very hard to stamp out their celebrations, by two brutal world wars, by the deadening totalitarian regime of the last century that attempted to crush all traces of spirituality and finally by modern consumerist cultural homogeneity. And yet they still light Beltane fires... after all that. Now that's resilience. There's another way I celebrate Beltane with my children. This is the time of year when we read books about environmental problems and the heroes and heroines of earth-protection movements. We talk about what we can do to help. We pick up litter and I give the kids lessons in conserving energy, reducing waste and recycling. 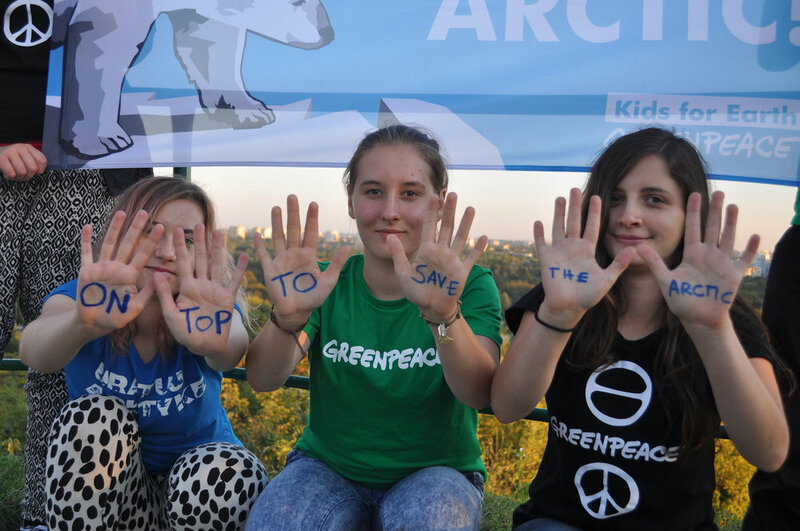 We talk about Greenpeace and renew our family contribution. We garden and write letters for environmental activism. These are small things but they are part of the season for us. And this too is connected because the earth is "the witch" in so many ways--the quintessential outcast mother figure. The earth has suffered so much and continues to come back. There are places in the Czech Republic that were utterly devastated twenty years ago, the trees all gone and the ground literally gray from the effects of massive acid rain and coal smoke. Industrial conditions have been improved in that area and those places that seemed beyond salvage a few years ago are now some of the most beautiful areas of the country. And that's resilience. As our ancestors kept on living and loving through all they endured... as the earth keeps on regenerating despite incredible abuse... as the spring always comes again after winter, may Beltane bring us the blessings of resilience. Leaf crowns: Construct a simple crown by making a cardboard headband. You can either use double-sided tape and stick real leaves to the headband for a quick and particularly verdant crown or you can paint paper leaves and glue them on for something a bit more durable. Flower babies: Paint small balls in various skin tones and add faces to them. Crumple colored tissue paper around them to make petals and glue in place. Attach a pipe cleaner to the back to make a flower and you have cute images of flowers and babies combined. Miniature maypole: You can make a miniature maypole as a table decoration. Fill a pretty bowl with play doh and stick a fairly straight stick into the middle of it. Make a ring out of a piece of ribbon and attach this to the top. Then take lengths of various colored ribbons and attach them to the ring, letting them hang down on the sides or attaching them to the edges of the bowl. Flower cake: Make your favorite cake base but add dandelion, violet and daisy petals to the batter. Then make pink frosting with a package of cream cheese, a few teaspoons of beet or black berry juice, two tablespoons of lemon juice and powdered sugar to taste. Decorate the top with more flower petals and candied violets (my recipe here). Spring bounty salad: Make a salad with young greens and herbs and add edible flower petals such as dandelion, violets and daisies. Put goat cheese, boiled eggs, seeds and oil and vinegar on top. I like to sing Simple Gifts and The Earth is Our Mother at Beltane time. Here we go round the Beltane fire, the Beltane fire, the Beltane fire. Here we go round the Beltane fire in the rite of spring. The earth, our mother, rises again, rises again, rises again. The earth, our mother, rises again with the coming of spring. Come and dance for love and joy, love and joy, love and joy. Come and dance for love and joy, that all may live and grow. I love a dynamic discussion. Feel free to comment and share your own experiences. If you liked this post, you are welcome to join my hearth-side email circle below. This is where you get an occasional virtual cup of tea and the links to my latest posts. And that's all you'll get because this is my protected, spam-free corner of the internet.